Hey! Happy New Year! Shall we start 2017 with something simple, healthy and delicious? Yes? Cool! I admit, I’m not one for making New Year’s resolutions. That’s not to say that I don’t make changes in the new year, more that I’m reluctant to make a definitive list of ‘things I must change about myself’ only to promptly fail and then feel worthless. However, after all of that Christmas indulgence, I’m certainly ready to re-invigorate my diet and work plenty of extra veg back into my weekly meal plan. In fact, I’m positively excited about it! 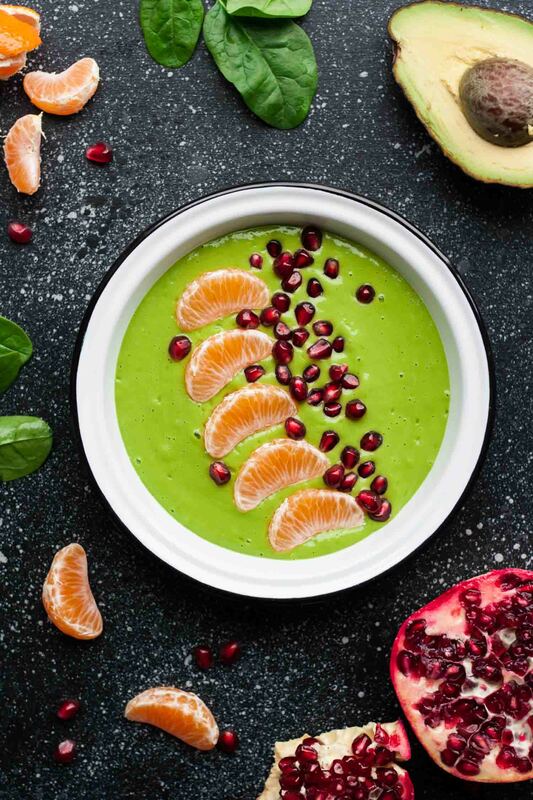 Enter these Clementine Green Smoothie Bowls. Clementines are one of my all-time favourite fruits but I only eat them around Christmas-time. That’s the only time of year that I crave them (which makes sense, as it’s when they’re in season) and we get through a few crates of them over the festive period. 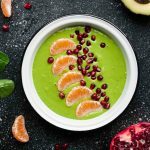 I’m not quite ready to let go of them just yet, hence I decided to make these smoothie bowls with them! 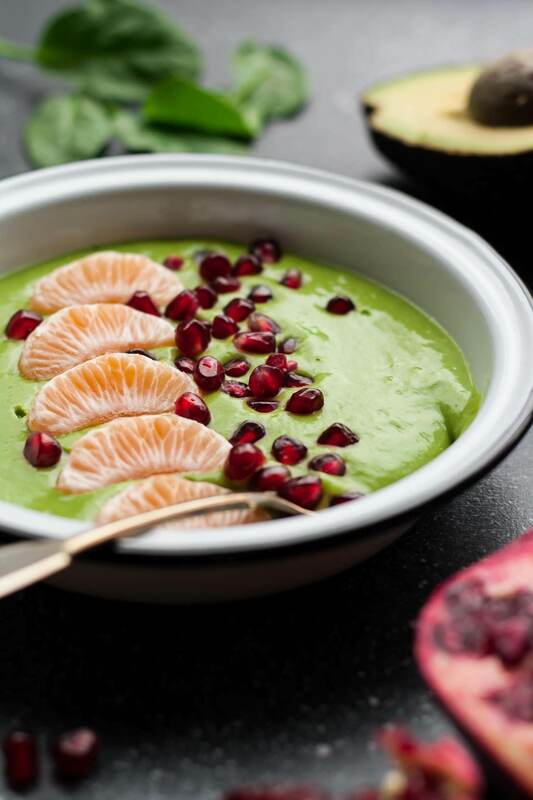 Although, blood oranges are right around the corner and clementines will soon be a distant memory – and these smoothie bowls would be amazing with blood oranges too! Historically, I don’t have the best track record with making smoothies (exceptions being this Mint Chocolate Smoothie Bowl and this Blood Orange and Mango Smoothie, which are both awesome). I have a tendency to come up with some wild concoction and then proceed to throw things into the blender without consideration, resulting in a glass of at best bland- and worst foul-tasting gunk. 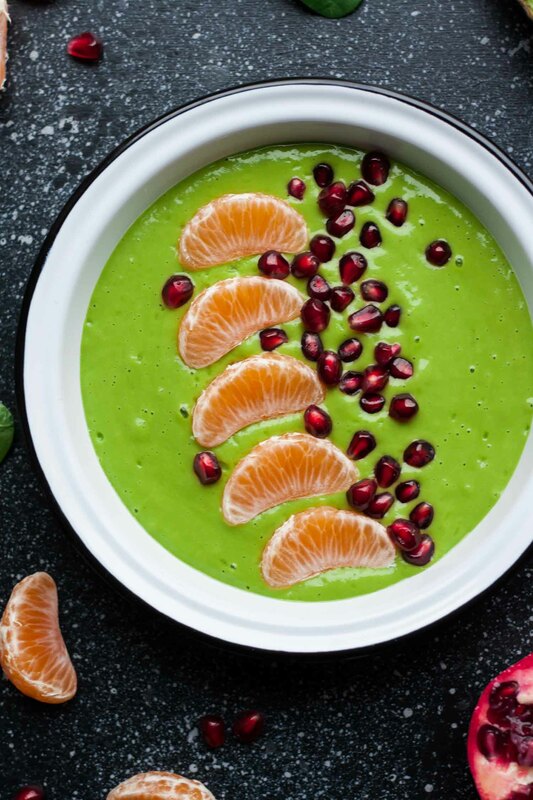 Not these Clementine Green Smoothie Bowls though! Nope, these are perfectly balanced, creamy and smooth – I don’t know about you but I can’t stand a bitty smoothie. The clue is in the name, right? So are you ready to meet your new favourite snack or breakfast or dare I say it – lunch? I know, I know, I’m probably the last person to ever consider eating a smoothie bowl for lunch. BUT. Do you ever have those days where you’re just really busy doing something and you kinda forget to eat? I can barely believe it either, but it does happen to me sometimes, especially when I’m working on several blog recipes in one day. This recipe is perfect for those days. 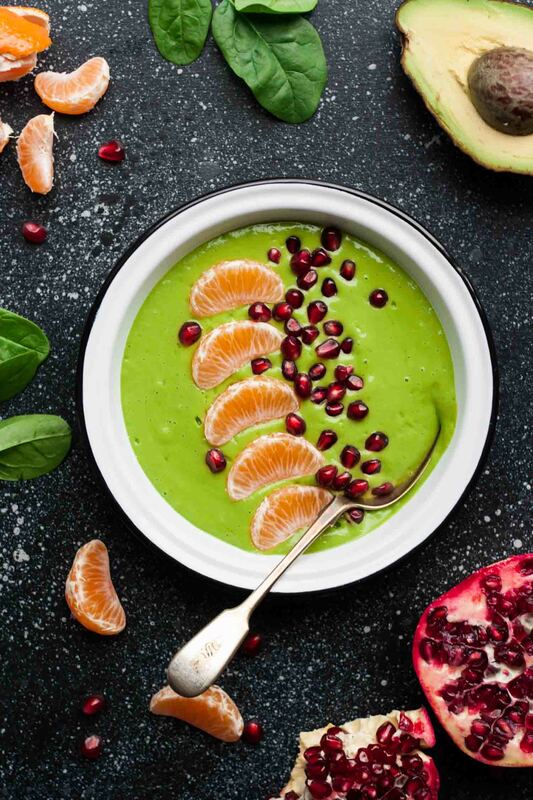 These bowls contain just a few wholesome ingredients – avocado/banana/clementine/spinach/almond milk/lime juice – which blend together to create an epic green smoothie thick enough to eat with a spoon, although you could add more liquid if you’d rather drink it! This smoothie is tangy and slightly sweet – the perfect balance if you ask me. It doesn’t taste overly ‘green’ either which is always a bonus! These are amazing topped simply with extra clementine segments and tart pomegranate arils, but you could top them with anything you fancy! Nuts, seeds, granola and nut butter are all fantastic options. Get creative and enjoy! Place all ingredients into a powerful blender and blitz until smooth. 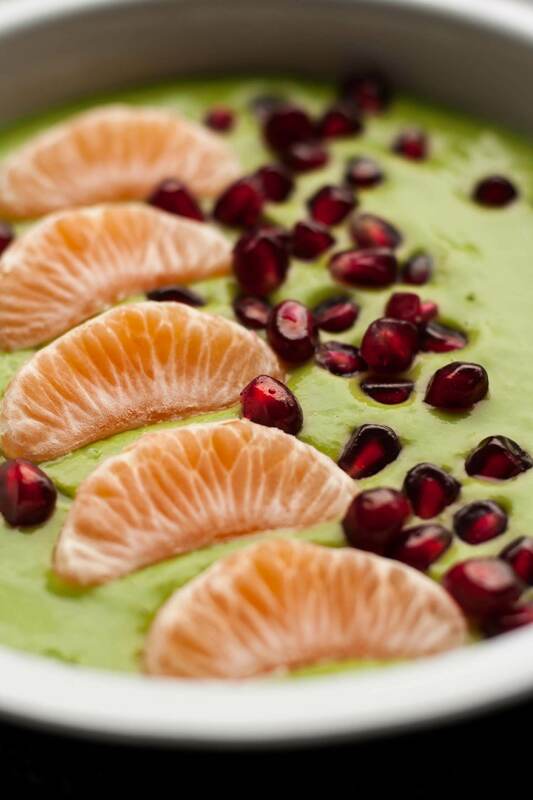 Pour into 2 bowls and serve topped with clementine segments and pomegranate - or anything you like! I used a fairly large avocado so you might need to add up to 3/4 avocado if yours is small. Nutrition information is for 1 smoothie bowl, without toppings. « Top 10 Recipes of 2016! Sounds like a great mix! I don’t have the best smoothie track record either, but that means its time to give it another shot ? Haha, I’m glad I’m not the only one! You should definitely give it another shot and if not – you should absolutely try these! Wow! These bowls are beautiful! Perfect healthy breakfast or lunch for New Years Resolution season. I’m pinning for summer when I always want something cool and refreshing. This looks like it would hit the spot. Thanks Jenna! This definitely hits the spot for cool and refreshing! Love the pictures and it is such a creative combo. I will definately be giving this a try. Thanks for sharing!